Today I’m going in search of the spot where, on a summer day in 1901, my great-grandfather, later the nature columnist for the Sheffield Telegraph, set up his easel and painted the small figures of his young wife and infant son, my grandfather, in a meadow surrounded by hedges and foxgloves. Over a hundred years have passed since he painted this picture, so looking for the exact spot could well be a fool’s errand. How many of the landmarks still remain? And, more importantly, was the scene that he painted based on a real place, or did he conjure it from his imagination? The day in early May that we go searching for this place is a far cry from the summer day my great-grandfather painted. There’s a strong wind blowing from the northwest and the rain is siling down. In the woods, bluebells are in bloom, but their bells are frosted, almost translucent, their color leached out by the cold. Except for the leaves on the trees and the fierce greenness of the fields, you could be forgiven for not knowing that it’s spring. My mother beside me, I drive the hilly and narrow lanes, the wipers thrashing across the windscreen in a near-futile attempt to clear our vision. At various places I get out of the car to survey the landscape, the frigid rain lashing my face and hands. I stop at about five or six places, and at each I compare a color copy of the painting to the actual view, looking for the two most identifiable aspects of the landscape–the village of Whatstandwell wending its way up the opposite hillside and, on the horizon, the limestone dome with the tower of Crich Stand (the third incarnation built in 1851, the fourth in 1922). But in Great-Grandad’s painting the cottages, the dome, and the tower are nowhere to be seen, and there’s nothing else to even hint that this is the place. My mother and I must have got it wrong. 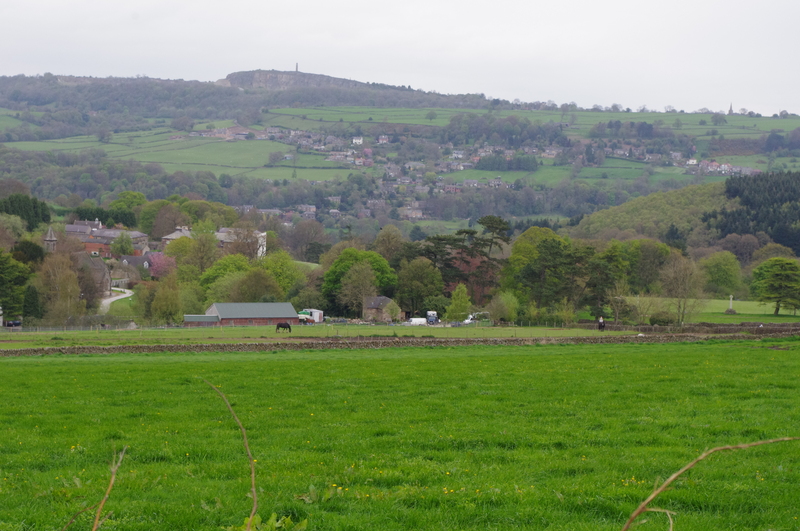 Either J B Wallis didn’t do the painting in Alderwasley, or he must have painted the landscape from his imagination. 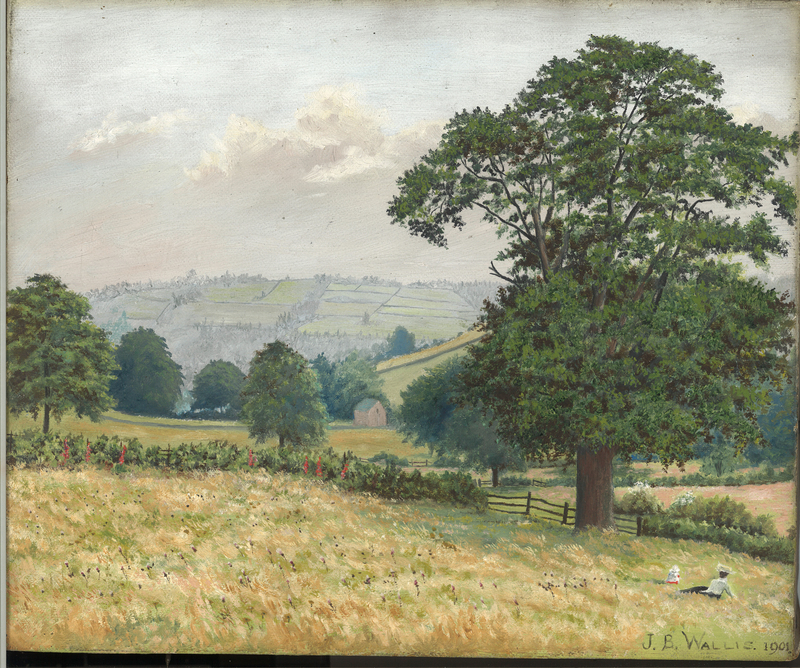 I feel downhearted; it would have meant so much to me to have found the spot where he’d painted this idyllic summer day with my great-grandmother and grandfather in the meadow grass. I never knew him; I was born a year after he died, but I so want to see what he saw, to understand why he chose to paint as he did. We’ve been driving around for an hour in this frightful weather, with occasional forays out of the car to survey the scene, to no avail. It’s time to abandon this wild goose chase. We’ll go back to the farm and beg a cup of tea off my cousin Julie, get the chill out of our bones. I stop a final time, take one last look at the landscape, and then I see, nestled in a dip, a little stone barn. There’s a stone barn in the picture, too, but it can’t be the one I see here. Nothing else in the painting tells me this is the right place. I walk towards the car where the heater is pulsing out warmth, the windows so steamy they obscure my view of my mother. But yet, the stone barn. There’s something about the stone barn. I turn back and, holding up the rain-spattered copy of Great-grandad’s painting, view it against the landscape. The barn that I see before me has what looks like an addition to the left, and there’s a little tree out front that slightly obscures my view. But what if the bit to the left has been added since 1901? Might it be the same barn? I widen my perspective to look more closely at the contours of the landscape and the position of the woods on the far hillside. Crich Stand and Whatstandwell are still missing in the painting, but now I’m able to recognize the rounded hills on the horizon and the slope that descends from the right of the painting and ends behind the little stone barn. The barn has given me what I needed. I had been fooled by noticing only what was missing. I continue to analyze the painting for another sign that I’d found the right spot, and on the horizon I see trees, and something that’s not quite a tree. I look again: could the shape that’s not a tree perhaps be the Norman church of St Mary’s in Crich? To test my theory that I’d found the right place, I drive to the barn. Four large fierce-looking dogs approach me at a run, barking, then slow down and circle me, perhaps sensing that I’m no danger. Soon afterwards a man appears, not looking pleased to see an interloper. To head him off from ordering me away, I ask him if he can help me: does he know anything about this barn, because I believe it may be in a painting done by my great-grandfather in 1901. He does indeed; in fact, he owns it. And does he know if the barn has been altered? I ask. Again, yes indeed. He has put an addition on the far side of the barn, shown at the left of the original barn in the painting. Something thuds into place in my chest. I have found what I was searching for! I look again at the painting, to see how he constructed it. The elm tree, which may or may not have been here in 1901, though it is so carefully painted I think it must have been, commands the right side of the painting, holding earth to sky. But it is the center of the painting that captures my attention, my eye moving from the foreground to the background with its wave of hills and fields unbroken by signs of human habitation, save for the barn. Even the two small figures on the lower right feel incidental in this homage to a glorious landscape. We will never know why J B Wallis painted the picture the way he did, but we do know that, writing as “The Rambling Naturalist,” he devoted his life to celebrating Nature. I am glad to have found this spot where my great-grandfather, a young husband and new father, took in the contours of the land and the little barn, of his wife and infant son, on a lovely summer day in 1901 and decided what to paint, what to leave out, then lifted brush to canvas. What a gorgeous, poignant post, Ginnie! I’ve never even been here, yet you’ve enticed me to miss this place. Lovely!! cousin ginnie i found your blog, i am trying to get re-aquainted with facebook, and i found this. i couldn’t stop reading. its really lovely. your blog is great thank you. alison. Oooh, goosebumps as I read this. IotaManhattan, thank you! That’s exactly how I felt at the time, too. Thanks for the comment, and I love reading your blog.